Today’s multivector and persistent threats, fluid IT environments, and increasing user mobility are prompting more organizations to seek next-generation firewall (NGFW) capability that provides affordable and effective layered threat protection. While a range of solutions have emerged to try to meet this need, an NGFW that includes all necessary capabilities for effective security today is rare. Significant security challenges are not only faced by large enterprises, but every organization, regardless of its size. Not surprisingly, advanced threat defense has become a boardroom conversation as organizations of all sizes seek to better protect their customer data, employee information, intellectual property, and corporate secrets. 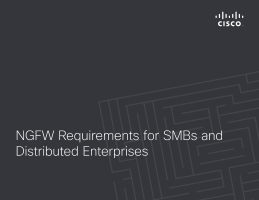 Download this white paper to help confirm your small business or distributed enterprise needs to invest in an effective NGFW solution. The NGFW should help your organization defend against targeted and persistent malware attacks, including emerging threats.